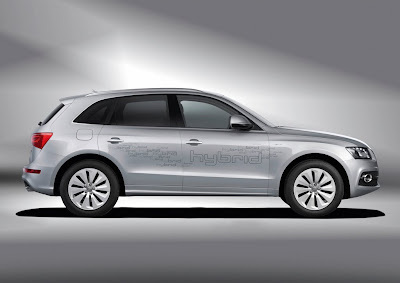 Yesterday, we posted the first details (and a couple of videos) of the Audi Q5 hybrid quattro. At the time, we mentioned that "we imagine more in-depth coverage will be available soon." We had no idea that "soon" would mean a matter of hours. Considering the vast quantity of technical jargon that's associated with the Audi Q5 hybrid, we'll allow Bernd Huber, Technical Project Manager of the Audi Q5, explain everything after the jump. Power like a V6, fuel consumption like a four-cylinder TDI – after three generations of the Audi duo, the Q5 hybrid quattro is the first hybrid model from Audi with two drive systems. Its gasoline engine, a 2.0 TFSI, and its electric motor have a system output 180 kW (245 hp) and 480 Nm (354.03 lb-ft) for sporty dynamics – the mean consumption in the normal cycle (NEDC) is limited to less than 7.0 liters per 100 km (33.60 US mpg). During the development process, Audi focused on a high share of electrically powered driving. 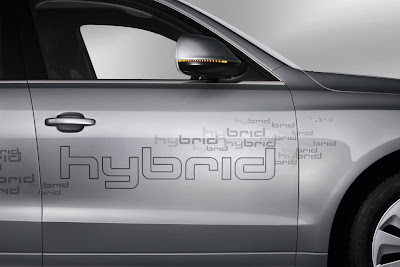 The sportiest hybrid SUV on the market covers about three kilometers (1.86 miles) locally emission-free at a speed of 60 km/h (37.28 mph), and can drive up to 100 km/h (62.14 mph) under electric power alone. 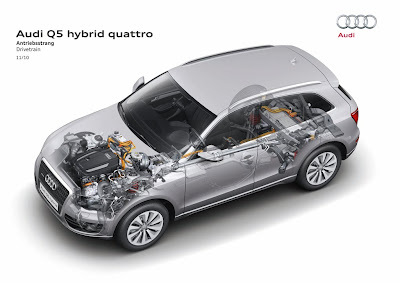 With the equally powerful and lightweight lithium-ion battery and many other solutions, the Audi Q5 hybrid quattro represents the state of the art. 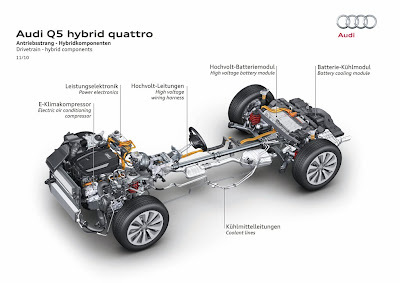 The 2.0 TFSI and the electric motor of the Audi Q5 hybrid are mounted directly behind one another as a parallel hybrid system – a straight-line concept with impressive efficiency. Together they have a system output of 180 kW (245 hp) and a system torque of 480 Nm (354.03 lb-ft). The new top model in the successful Q5 series sprints from 0 to 100 km/h (62.14 miles) in 7.1 seconds, while the interim sprint from 80 to 120 km/h (49.71 to 74.56 mph) is accomplished in fifth gear in 5.9 seconds. The powerful propulsion ends at no less than 222 km/h (137.94 mph). The consumption by the Audi Q5 hybrid quattro lies under 7.0 liters per 100 km (33.60 US mpg) in the normal cycle – that corresponds to a CO2 emission of less than 160 g/km (257.50 g/mile). The 75 liter (19.81 US gallon) tank yields a reliable range comparable to that of a TDI. 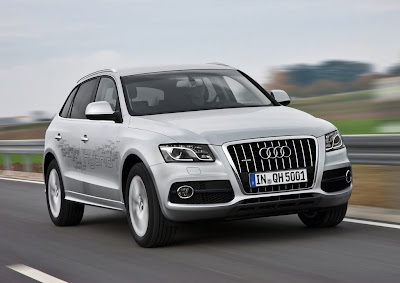 The 2.0 TFSI in the Audi Q5 hybrid quattro has a displacement of 1984 cc (121.08 cu in). Its output is 155 kW (211 hp), with the maximum torque of 350 Nm (258.15 lb-ft) permanently available at 1500 to 4200 rpm. The 4-cylinder engine combines direct injection with turbocharging – typical for the Audi philosophy of downsizing, which replaces displacement by charging. The Audi valve lift system (AVS) further increases power, torque and efficiency by switching the stroke of the exhaust valves between two stages depending on the load and rpm. 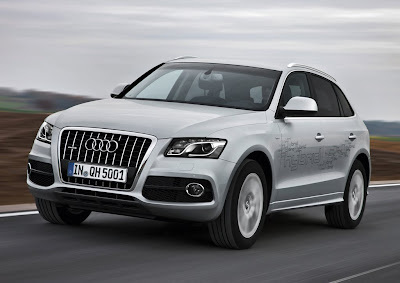 The 2.0 TFSI has been overhauled in some respects for use in the Audi Q5 hybrid. The drive of the ancillary units has been dropped, and the crankshaft bearing and fine tuning of the turbocharger have been adapted to the specific demands. A secondary air system at the cylinder head makes sure that the exhaust gas treatment cuts in particularly fast. Integrated in the engine control unit, the so-called hybrid manager controls the efficient change and smooth transitions between the operating modes, and was fully developed by Audi alone. A largely modified eight-speed tiptronic serves the power transmission without the aid of a torque converter. 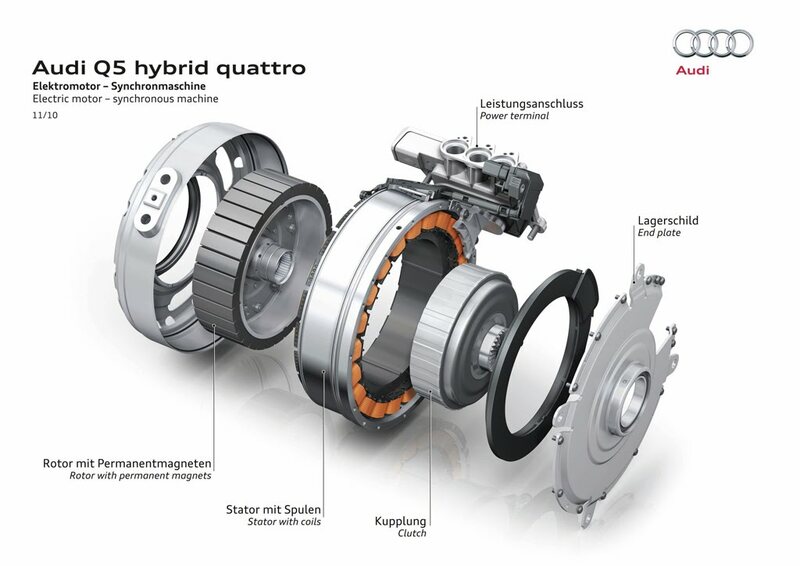 Its place is taken by the disk-shaped electric motor, combined with the multi-plate clutch operating in an oil bath – it couples and decouples the electric motor and the TFSI. The innovative decoupler operates with high precision, smoothly and quickly in any situation. The highly comfortable and fast-shifting hybrid gear unit contributes significantly to the efficiency of the Audi Q5 hybrid – its eight gears are widely spaced. When the 2.0 TFSI is turned off, an electric pump maintains the oil pressure in the hydraulic system to safeguard the convenient start-stop feature. The power electronics, connected to the battery and the electric motor by high-voltage cabling, is located in the plenum chamber of the engine compartment. In the form of a so-called pulse-controlled inverter, the power electronics serves as a controller between the battery, which outputs direct current, and the electric motor that operates on alternating current. Innovative technologies keep the volume and weight of the power electronics low, with cooling provided by a separate low-temperature water-filled circuit. The component includes a DC/DC converter that couples the electric consumers in the 12 V electrical system with the high-voltage network. A so-called permanently excited synchronous machine serves as an electric motor, as a starter and – during deceleration – as a generator. It outputs up to 33 kW (45 hp) of power and 211 Nm (155.63 lb-ft). The electric motor is integrated in the cooling circuit of the engine. 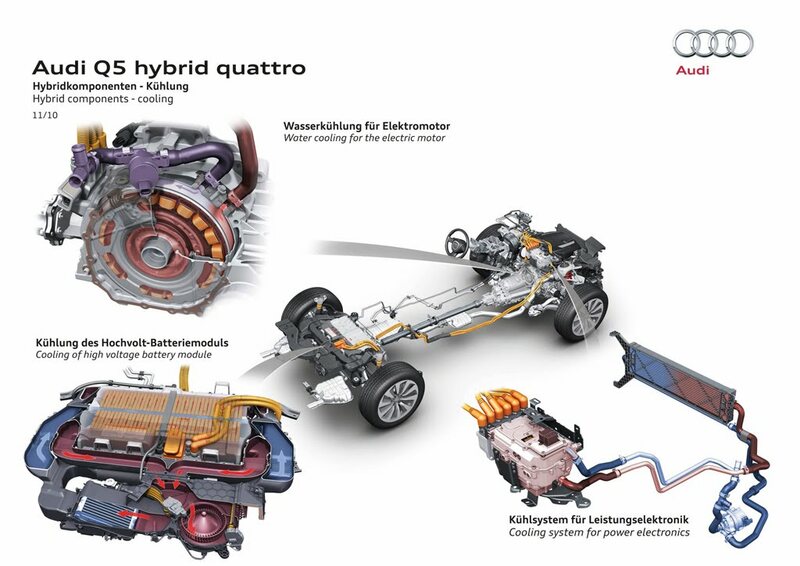 A lithium-ion battery system, weighing merely 38 kg (83.78 lb), serves as the energy store for the electric motor of the Audi Q5 hybrid quattro. The compact unit with its 26 liter (6.87 US gallon) capacity is positioned in a crash-safe area under the loading floor, with hardly any detriment to the luggage compartment. The battery consists of 72 cells; at 266 volts its nominal energy is 1.3 kWh and its output 39 kW. The lithium-ion battery is cooled by air in two ways, depending on the requirement. At low-temperature load, it draws temperate air from the vehicle interior by way of a fan. If its temperature exceeds a certain limit, a separate refrigerant circuit is activated. It is coupled to the main climate control system of the vehicle and uses a separate evaporator. This heavy-duty active cooling system distinguishes the Audi Q5 hybrid quattro from many other hybrid vehicles, and makes a key contribution to the high electrical availability of the hybrid system. 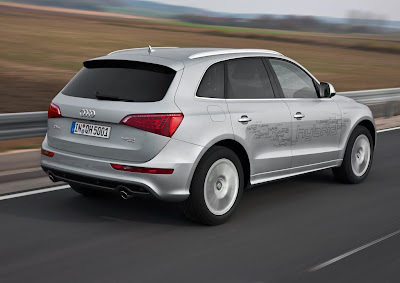 With its parallel hybrid system the Audi Q5 hybrid quattro can travel in five different operating modes. Driving with the combustion engine alone, with the electric drive alone or in hybrid mode is possible, as are recuperation and boosting. At a standstill, e.g. before starting or at a traffic light, both drive sources are deactivated. 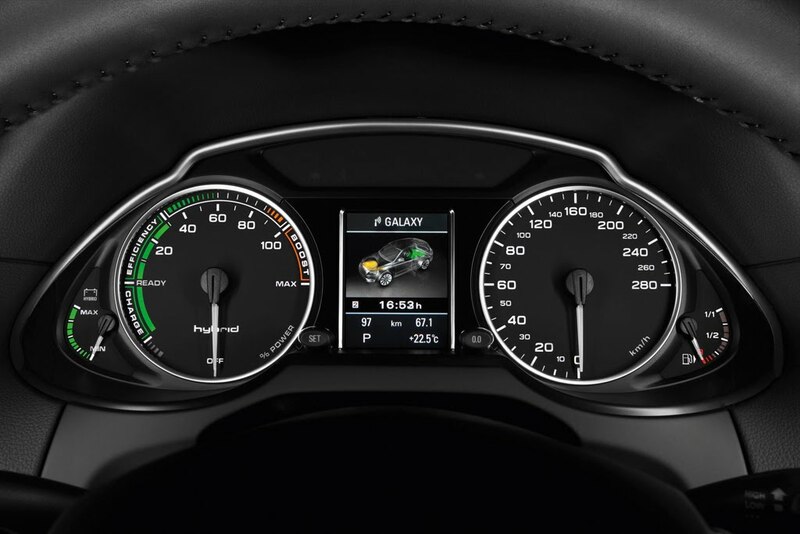 In this convenient start-stop mode the climate control system remains active. Once the driver releases the brake, the Audi Q5 hybrid quattro starts rolling. It can be driven up to 100 km/h (62.14 mph) under electric power – with almost no noise or local emissions. At a constant 60 km/h the possible range is three kilometers (1.86 miles) – this high electrical share of the driving suffices for most residential areas and many urban centers. The driver can change between three programs using a button on the center console or a selector lever. The EV characteristic map gives priority to the electric drive in the city, the D mode controls both motors for optimal consumption, and the S mode as well as the touch control gate of the tiptronic are designed for a sporty driving style. When the driver accelerates sharply, the combustion engine serves as a power source for the drive. The electric motor is then actuated by the operating strategy in order to achieve optimal efficiency and consumption. In quick acceleration, or "boosting," the electric motor operates together with the TFSI; at full throttle in the S mode the full system output is briefly available. The hybrid drive then supplies the propulsion power of a large naturally aspirated engine, but with far more efficiency. When the driver releases the accelerator, the electric motor acts as a generator and recovers energy. In most situations the TFSI is then decoupled from the drive system so as not to cause any loss from towing. The electricity recovered by the electric motor here and in braking is buffered in the lithium-ion battery. If the driver brakes only slightly, the electric motor performs the deceleration itself; in more forceful braking the hydraulic braking system is simultaneously activated. The Audi Q5 hybrid comes with a new display concept, rendering the individual driving states of the hybrid drive clear-cut and tangible. 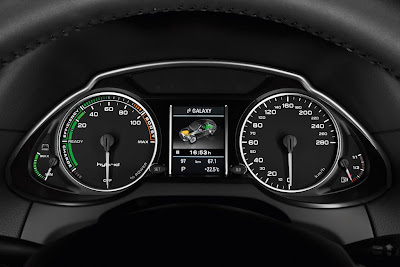 Instead of the tachometer, the needle of the power meter in the dash panel insert indicates the total output of the system on a scale of 0 to 100 per cent. A second scale is divided into colored segments – their green and orange-colored sections show at a glance how the Q5 hybrid quattro is currently traveling – with a greater share of electrical power or combustion engine power. An additional instrument displays the charge level of the battery. At the same time, the display of the driver information system and the large monitor of the MMI Navigation plus show the operating states and power flows in the hybrid system in elegant graphics with a three-dimensional effect. The MMI screen also displays differentiated consumption and recuperation statistics in easily understandable bar graphs. The MMI Navigation plus is standard on the Audi Q5 hybrid quattro, and comes in the latest stage of evolution. The storage capacity of the hard drive is 60 GB, the menus can be selected via a state-of-the-art wizard, and the album tracks are displayed using the cover artwork. An external device such as a cell phone or player can be connected via Bluetooth, and the voice input understands town and street names in a single command. The resonant Audi sound system is also standard. The permanent four-wheel drive applies the power of both power units safely to the road in any situation. In the normal condition the sporty drive is emphasized at the rear; if need be, it transmits most of the power to the axle with the better traction. The sophisticated running gear includes many aluminum components for reduced weight. The Audi Q5 hybrid quattro may pull trailer loads of up to 2000 kg (4409 lb). An electro-mechanical unit serves as the steering system, with a small electric motor generating the power. The system operates at high efficiency, since it need not consume any energy in straight-ahead driving. The brake servo is additionally supplied by an electric vacuum pump. A complex rule-based strategy adapts the braking to the conditions of electric driving and energy recuperation. 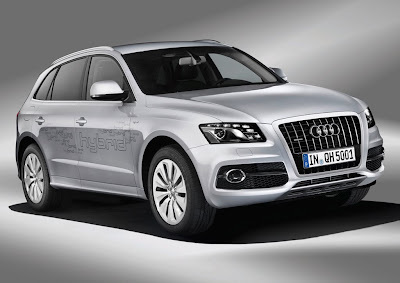 The Audi Q5 hybrid quattro is distinguished by visual features on the outside. The tailgate, the fenders and the aluminum sill panel strips bear the hybrid lettering. The radiator grill is glossy black, and the tailpipes chrome-trimmed. Polar Silver, metallic is available for the exclusive paintwork. The 19 inch cast aluminum wheels were specially designed for the hybrid – their ten spokes resemble turbine blades. The tires are size 235/55. On request Audi supplies other wheels with 19 and 20 inch diagonals, with an S-line bumper available from quattro GmbH. The body is unusually light in weight; the tailgate and the engine hood are aluminum. The rigid body shell incorporates hot-stamped steel at numerous places, combining low weight with very high strength. Despite the generous level of standard equipment, the Q5 hybrid quattro with its curb weight of less than 2000 kg (4409 lb) is the lightest hybrid SUV on the world market. All its hybrid components add less than 130 kg (286.60 lb) extra weight. 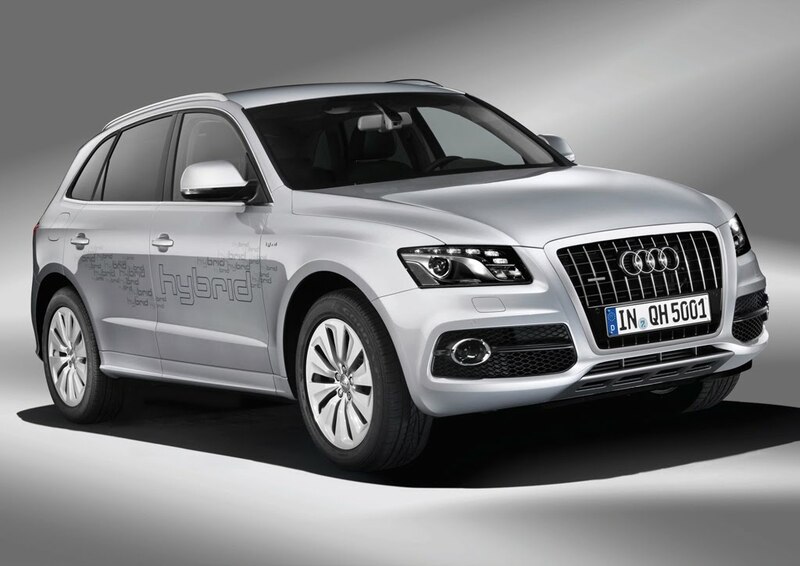 The climate control system of the Audi Q5 hybrid was adapted to the requirements of electric driving. The compressor of the air conditioning has a high-voltage based electric drive; demand-controlled for high efficiency, the compressor ensures AC operation even when the combustion engine is shut down. An electric auxiliary heater supports the interior heating. The Audi Q5 hybrid quattro offers almost the same equipment as its successful sister models – the model series leads the European market in the mid-sized SUV segment. The options also include sophisticated driver assistance systems. A new feature is connection to the internet via the optional Bluetooth car phone online. A UMTS model sets up the connection to special services from Google and the World Wide Web, bringing the latest news and weather information into the vehicle. The driver can plan his or her travel route at home, save the information in an area of the internet site www.audi.com and from there download the data into the navigation system via UMTS at the start of the trip. Through the fast connection the hybrid SUV also downloads three-dimensional satellite images and aerial photos from Google Earth. They appear as bird's eye views on the monitor; the computer draws in the roads. Another high-end feature is the WLAN hotspot, allowing connection to the internet via up to eight terminal devices. Communication occurs via the roof antenna, the connection is very stable and the reception quality excellent. Thanks to a special modulation process, UMTS data transfer occurs at speeds up to 7.2 MB per second. Encryption follows the WPA 2 standard – a very secure method. The use of the WLAN hotspots is as easy as can be – the driver need merely insert a data-capable SIM card. At the same time the driver can pair a cell phone with the system via Bluetooth, if the phone has the SIM Access Profile. The existing mobile phone contract with a data option suffices in most cases with the result that no additional charges or separate contracts are necessary.